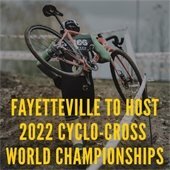 FAYETTEVILLE, Ark.— The City of Fayetteville is excited to announce that Union Cycliste Internationale (UCI) selected Fayetteville to host the 2022 Cyclo-Cross World Championships. The announcement came today in Bogense, Denmark, site of the 2019 Cyclo-Cross World Championships, after ratification by the UCI Management Committee. This is the second time the race will be hosted in the United States; the first time was in Louisville, KY during 2013. The site for the event has yet to be developed; plans for the park include state-of-the-art cyclo-cross and mountain biking facilities that will connect to Fayetteville’s existing 45 miles of shared used paved trails and 38 miles of natural surface trails. The City of Fayetteville purchased the 228-acre property on Millsaps Mountain, northwest of Highway 62 and I-49 from Centennial Bank in 2018 with a 50-percent matching grant from the Walton Family Foundation. The park parcel is located within three miles of 620-arcre Kessler Mountain Regional Park, home to more than 13 miles of hiking and biking trails and numerous athletic fields with additional phases to come. That plan includes continuing the support and growth of the local cyclo-cross scene through infrastructure development and education, as well as bringing multiple national-level cyclo-cross events to Northwest Arkansas leading up to the World Championships event January 29 - 30, 2022. Cyclo-cross is a fall and winter cycling discipline that has grown dramatically in the last decade, especially in the United States. Competitors race on a spectator-friendly course approximately 1.75 miles (3 km), in length that includes short steep hills and obstacles that may require dismounting and running with the bike. Races take place “rain or shine, making cyclo-cross riders some of the toughest competitors across disciplines.